The terms Siva or Sankara mean Auspicious. Sam means Chitaananda (Blissful Awareness). Kara means the one who causes it. Sankara means the One who causes blissful awareness. Sankara is the One who confers Chitaananda on those who take refuge in Him or adore Him. The secret of Creation is evident from the description of the form of Siva. The crescent moon on Sivas head symbolizes the consciousness in human beings, the Ganga symbolizes the Life Force and the snakes on Sivas body represent the myriad of living beings. He resides on a silver mountain. His dearest friend is Kubera, the Lord of Wealth. Despite being endowed with all these, why was He obliged to carry the begging bowl? To demonstrate to the world that every kind of wealth is a hindrance to spiritual advancement, Siva renounced everything. It is through renunciation Siva became the eternal embodiment of supreme bliss. Iswara is also symbolized in the Linga Form, Lings is derived from the Sanskrit root, Li, means Leeyathe, 'merges'; it is the form in which all forms merge. Siva is the goal who blesses beings with the most desirable gift of meaning in the universe. That is the end, the death, which one should strive for, the end which Siva can vouch-safe. Siva means, graciousness; auspiciousness; Mangalam. He is all graciousness, ever auspicious, Sarva Mangalam. That is the reason why the epithet, Sri, which indicates these qualities, is not added to the name Siva, Sankara, lsvara etc. It is added to the number of Avatars, for they have taken on perishable bodies for a specific purpose. They have to be distinguished from other humans, by the epithet, Siva is eternally gracious, auspicious, mangala and so the epithet is superfluous. Siva is adored as the teacher of teachers, Dakshinamurti. The form of Siva is itself a great lesson in tolerance and forbearance. The Lord has another name. It is only when the love principle underlying this name is rightly understood, the real form of the Cosmos can be recognized. That name is Saambasiva. Saa means divinity. Amba refers to the cosmos. Siva means the Supreme person (Purusha). Easwara has yet another name: Yogasikha. The sky is His blue form. The directions (Dik) are His garment. Hence He is known as Digambara. He is also known as Panchaanana - the Five-headed One. The five are: Earth, water, fire and aakaasa (space). His five heads represent the five basic elements (panchabhuthas). Siva is also described as Bhuthanaatha - the Lord of all created beings. Bhutha refers to creation. Easwara is the Lord of every creature in the universe. Hence, the entire cosmos is reflected as an image in the Lord. Siva is known as Subhankara- the one who is ever good (Subham). The three eyes of Siva represent the three worlds (lokas). Siva's trident is symbolic of the Past, the Present, and the Future, the three aspects of Time. The three gunas (Satwa, Rajas, Thamas) are images of the Trinity - Brahma, Vishnu, and Siva. The three worlds, the triune aspect of Time, the three gunas (qualities) are the manifestations of the Easwara Principle. It is for the well-being of the world that Siva swallowed the Halahala poison. 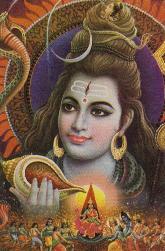 Again, it is for the sake of the worlds good that Siva contained the Ganga in His matted locks. Siva bears the moon on His head to confer peace of mind on mankind. When man moulds himself on the pattern of Easwara, he will get rid of all his evil tendencies and offer to the world what is good in him. That is the meaning of the worship of Siva. It is only when man gives up utterly his bad thoughts, evil desires and wicked deeds, he will be able to transform himself into divinity.